Moses Austin arrives in San Antonio where he will meet with Mexican authorities to ask permission for 300 Anglo families to settle in Texas. More than 3,000 children are expected to participate in festivities around the towering Rotary tree on Alamo Plaza tonight. “Wings”, a silent World War I epic filmed in San Antonio, premieres in New York. The movie stars Clara Bow and Buddy Rogers and features the (brief) film debut of Gary Cooper. The next year, “Wings” will be the first film to win an Academy Award for Best Picture. Kelly’s gigantic C-99, heretofore known as the XC-99 will open a new area in its historic flights today when it takes off on its first intercontinental flight for Europe. Women are allowed to vote in the Democratic primary in Texas for the first time. Candidate William P. Hobby for governor, Annie Webb Blanton for state superintendent of public instruction and other candidates favored by the women are victorious. Despite Department of Commerce rulings that Stinson Field is too small for a Class A municipal airport, Phil Wright, acting mayor, said he was going ahead with plans to clear the land there. Contruction of a gigantic hangar at Kelly Air Force Base, capable of housing 10 huge B-36 bombers simultaneously, will begin early in September. According to reports here it will be the largest building in the world. The Distinguished Service Cross is presented to Edgar Gardner Tobin, First Lieutenant (Air Service), U.S. Army, for extraordinary heroism in action near Vieville, France, July 16, 1918. While leading a patrol of three machines in the region of Vieville, First Lieutenant Tobin attacked an enemy formation of six single-seaters. He destroyed two himself and forced down a third out of control. Thirty San Antonio pecan shellers were working under police protection after a group of 50 labor agitators had tried unsuccessfully to make them strike. Parade fanfare and visits by Gov. Shivers and Hollywood stars will mark the world premiere of “The Man From the Alamo” at the Majestic Theater today. June 4 in San Antonio history..
Plans for the enforcement of Provost General Crowder’s “work or fight” regulations, call on all citizens to report to the nearest local draft board names of men within the draft age who are habitually idle or who are employed non-productively. The city council and City Manager Reynolds Andricks in a closed meeting today virtually wiped out the library board, selected a new corporation court judge and picked a replacement member of the Fire and Police Civil Service Commission. Veteran Chairman M. M. Harris, trustee of the library board for 33 years, got the axe. He was scratched, reports indicated, because of a letter he wrote to Andricks in which the new administration was criticized. That letter was introduced by Andricks at the session. Hemisfair celebrates “Ed White Day,” to commemorate the life of San Antonio astronaut Edward White Jr., killed in the Apollo I fire. Mrs. White and her children, Bonnie and Eddie, participate in a ceremony and are given Hemisfair souvenirs. B.B. King, along with Bill Harvey & his Orchestra, entertain at the Carver Library auditorium. Orchestral Manœuvres in the Dark, better known as OMD, performs in Laurie Auditorium with the Models opening. A Camp Travis soldier, who deserted on Nov. 2 after being demoted from sergeant to private, has been sentenced to ten years hard labor at the United States penitentiary at Leavenworth, Kansas. 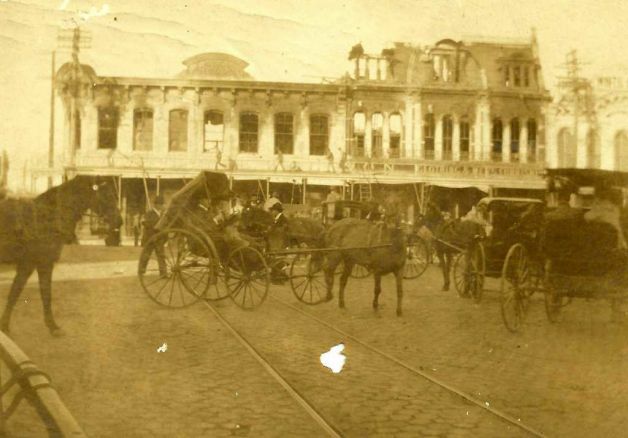 He was arrested at the railroad station in Von Ormy, awaiting the train, with a ticket to Laredo. The Municipal Auditorium features “Rhapsodies of 1954,” a triple-bill with former boxer “Sugar Ray” Robinson and Joe Scott, Count Basie and his Orchestra, and Billy Ward and the Dominoes. St. Sophia Greek Orthodox Church announced plans for a new sanctuary at St. Mary’s and Ashby. 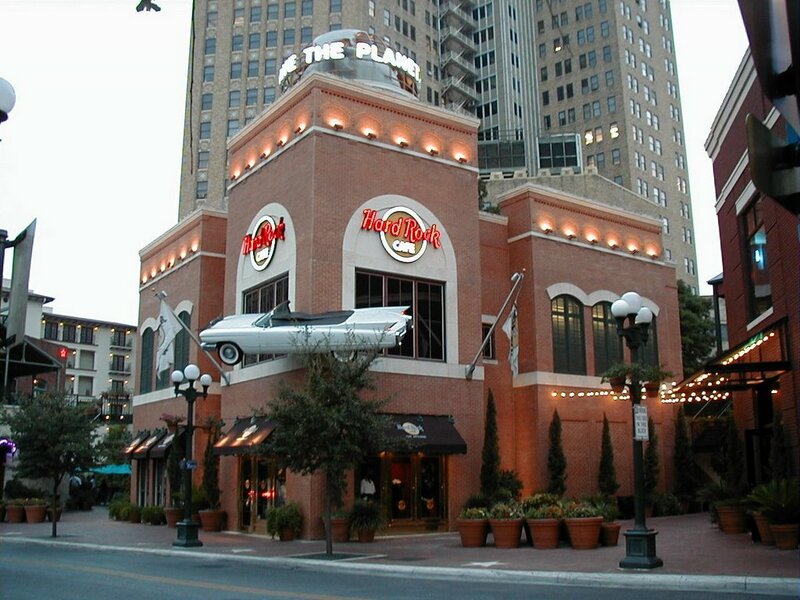 The San Antonio Hard Rock Café (right) holds its grand opening celebration. The State Legislature passes a bill to purchase the Alamo for a historic shrine for $65,000. Oscar Levant performs Gershwin’s “Concerto in F” and “Rhapsody in Blue” with the San Antonio Symphony at Municipal Auditorium. The Alamo Bowl, scheduled to pit the Hardin-Simmons Cowboys vs. the University of Denver Pioneers in Alamo Stadium, is postponed due to freezing temperatures and heavy ice. The game would eventually be played on January 4. Ray Charles comes to San Antonio for the first time and plays the auditorium at the Carver Library. He is second on a bill that features T-Bone Walker, Amos Milburn and Choker Campbell and his Orchestra. 47 years later, the Alamo Bowl is held again. The Cal Golden Bears defeat the Iowa Hawkeyes, 37-3, in the first Builder’s Square Alamo Bowl.